Many women worry about gaining weight during pregnancy, but gaining a healthy amount not only is normal, but necessary and expected. On average, women can gain from 11 to 15 kilos during pregnancy but it’s normal to gain a bit less or a bit more if you were overweight or underweight before getting pregnant. Nevertheless, gaining a reasonable amount of weight is crucial as it provides the adequate nutrition for mom and baby, while building adequate fat reserves for breast-feeding. 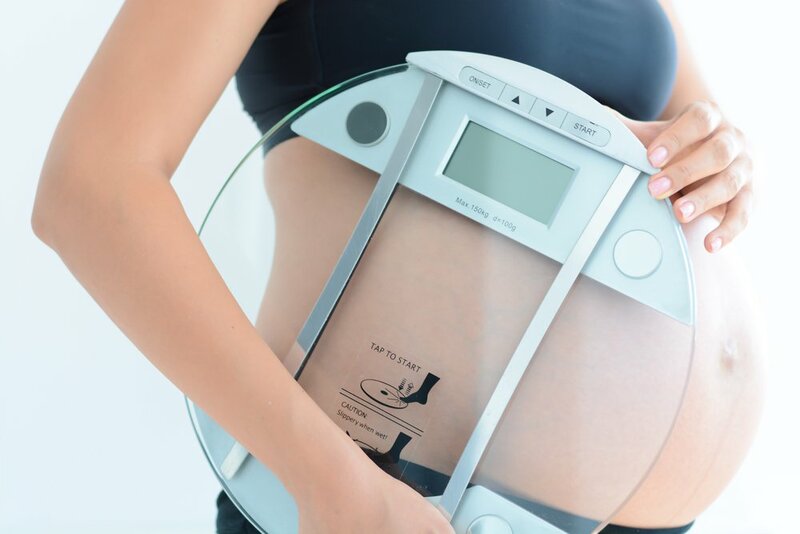 Although knowing that weight gain is necessary, seeing the number slowly creep up on the scale can make some women self-conscious, especially during the second trimester when weight gain is more evident. But the number on the scale should not get you down. Instead of concentrating on the amount of weight gained, focus on eating a balanced diet rich in vegetables, fruit, complex carbohydrates (whole wheat bread, pasta, rice, potatoes) and protein (lean meat or plant based protein). This will allow your body to gain weight at a slow and steady pace. Eating healthy is crucial for your health and your baby’s. Pregnancy is not a time to begin or maintain a restrictive diet. Dieting to lose or prevent gaining weight can put you and your baby at risk, so don’t cut out food groups and focus on eating five balanced meals a day (breakfast, lunch and dinner plus two snacks). Think of the nutrient content instead of the calories per meal. If you avoid processed food which tends to be high in fat, sugar and sodium you really can’t go wrong. It’s also important to listen to your body. If you are hungry eat something rich in nutrients and try to replace cravings with healthy natural options such as a rice cake with peanut butter and strawberries. Just remember that it’s okay to indulge on a craving every once in a while! – Underweight: It’s important to gain a reasonable amount of weight especially during the second and third trimester when the baby grows the most. Gaining appropriate weight will prevent your baby from being born earlier or smaller than average, and it diminishes complications at birth. – Overweight: It’s important not to gain too much weight as this can provoke gestational diabetes and high blood pressure, but it is not a time to try to lose weight either. – Healthy weight: Steady weight gain is important during the second and third trimester. This usually implies an extra 300 calories a day during the second trimester, and up to 500 during the third. – Multiples: If you are carrying two or more babies remember that it’s very likely that your weight gain will be slightly above average.